The South Carolina Department of Natural Resources will conduct a South Carolina Drought Response Committee Conference Call on October 26, 2016 at 10 a.m. The purpose of the drought conference call is to evaluate the drought status state-wide and make adjustments as warranted based on available data and observations. The Drought Response Committee conference call originally scheduled for October 10 was postponed due to Hurricane Matthew. The current drought status of South Carolina's 46 counties as of October 25, 2016; the South Carolina Drought Response Committee will meet October 26 to discuss potential changes/updates to this map. Changes are made to the status of the state's drought management regions by an officially recorded vote of the committee members. 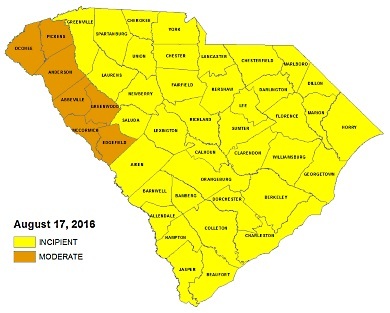 The S.C. Drought Response Committee last met on August 17, 2016 and upgraded the drought status for 17 counties in the state at that time. Interest in the drought situation is expected to be very high, particularly in the Upstate regions which has seen very limited rainfall over the summer and early fall. Members of the media are encouraged to join the call. Contact South Carolina's State Climatologist, Dr. Hope Mizzell, at (803) 734-9568 or e-mail at mizzellh@dnr.sc.gov for more information.